An area of a Material that responds to touch. Has a configurable shape and can be configured to clip splashes that extend outside its bounds or not. For a variant of this widget that is specialized for rectangular areas that always clip splashes, see InkWell. It starts to animate a highlight. 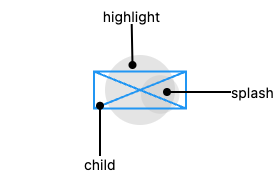 The shape of the highlight is determined by highlightShape. If it is a BoxShape.circle, the default, then the highlight is a circle of fixed size centered in the InkResponse. 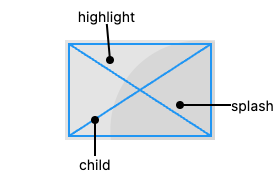 If it is BoxShape.rectangle, then the highlight is a box the size of the InkResponse itself, unless getRectCallback is provided, in which case that callback defines the rectangle. The color of the highlight is set by highlightColor. Simultaneously, it starts to animate a splash. This is a growing circle initially centered on the tap location. If this is a containedInkWell, the splash grows to the radius while remaining centered at the tap location. Otherwise, the splash migrates to the center of the box as it grows. 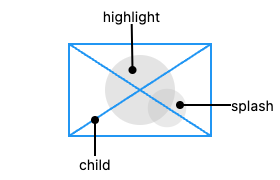 The following two diagrams show how InkResponse looks when tapped if the highlightShape is BoxShape.circle (the default) and containedInkWell is false (also the default). The main thing to notice from these diagrams is that the splashes happily exceed the bounds of the widget (because containedInkWell is false). The following diagram shows the effect when the InkResponse has a highlightShape of BoxShape.rectangle with containedInkWell set to true. These are the values used by InkWell. The InkResponse widget must have a Material widget as an ancestor. The Material widget is where the ink reactions are actually painted. This matches the material design premise wherein the Material is what is actually reacting to touches by spreading ink. If there is an opaque graphic, e.g. painted using a Container, Image, or DecoratedBox, between the Material widget and the InkResponse widget, then the splash won't be visible because it will be under the opaque graphic. This is because ink splashes draw on the underlying Material itself, as if the ink was spreading inside the material. If this is not possible for some reason, e.g. because you are using an opaque CustomPaint widget, alternatively consider using a second Material above the opaque widget but below the InkResponse (as an ancestor to the ink response). The MaterialType.transparency material kind can be used for this purpose. IconButton, which combines InkResponse with an Icon.